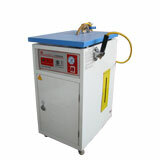 Specification: Steam Cleaner a necessary tool for dental technicians for cleaning. It is can be used for cleaning grease, stain etc. This machine has some of the most advanced functions. The machine is equipped with imported controlling devices which can automatically protect itself from lack of water, over-pressure and over-heat. This machine has the following characteristics: Strong heating power, quick steam generating power, high efficiency, strong air output pressure, stable pressure, and strong cleaning power. The low water alarm and the water-filling indicator enable users to use the machine continuously. The steam boiler has qualified certificate, which proofs it is safe to use. The steam boiler, housing, buttons, and indicators are made of stainless steel, making it more reliable and has a longer lifespan. The chamber capacity is large, one tank of water can be used for a long time. There are two spray modes for easy operations: Controlled spray mode and long spray mode. Company: Tianjin Lizhong Electronic Co., Ltd.